Government watchdog Judicial Watch has filed a complaint with the Board of Professional Responsibility in Washington D.C. against the Democrat operatives who legally represent Christine Blasey Ford. Ford is the woman who testified in front of Congress during Justice Brett Kavanaugh's nomination process. 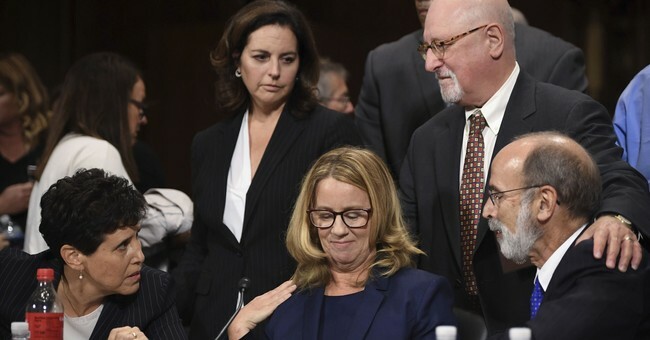 The filing was made after it was revealed during testimony that Ford was never informed by her attorneys, Debra S. Katz, Lisa J. Banks and Michael R. Bromwich, that staffers for Senate Judiciary Committee Chuck Grassley were willing to fly to her home in California, or anywhere she chose, for a private interview instead of public questioning. The offer was made after Ford said she has a fear of flying, despite regularly taking flights across the country and the globe. "By not informing their client Dr. Ford that Sen. Chuck Grassley, Chairman of the Senate Judiciary Committee offered in a letter to 'fly female staff investigators to meet Dr. Ford… in California, or anywhere else, to obtain (her) testimony, Katz, Banks, and Bromwich violated the following District of Columbia Rules of Professional Conduct," Judicial Watch released Friday. "Rule l.4(a) – A lawyer shall keep a client reasonably informed about the status of a matter and promptly comply with reasonable requests for information [and] Rule 1.4(b) – A lawyer shall explain a matter to the extent reasonably necessary to permit the client to make informed decisions regarding the representation." During her testimony, Ford stated she did not know the offer was made by Grassley's office. Katz is a long time activist for the left and has attended "resistance" rallies since President Trump won the White House in 2016. She also refers to those who work for Trump as "miscreants." In addition to Ford, Bromovich is also an attorney for fired and discraged Deputy FBI Director Andrew McCabe.